Yoga lover? Then AmaTierra is for you. AmaTierra offers daily gentle Hatha yoga classes for every body, no matter the age or ability level. Check our ongoing Yoga and Wellness Packages. 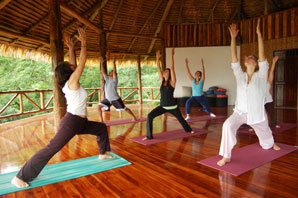 Yoga retreats and other special events are offered frequently at AmaTierra. AmaTierra hosts group retreats for yoga , self-help, spirituality and creativity seminars. Bring your friends for group rates or if you are a teacher looking for one of the most inspiring places on the planet to bring your students, please call for details. At AmaTierra you can Get Into Practice and relax deeply into your body as you breathe and stretch with Gentle Hatha Yoga. Many interesting forms of yoga are being taught these days, and all have their merits, but the basic Hatha style taught at AmaTierra is the foundation for physical yoga practice and has stood the test of time —a few thousand years! With the addition of our new studio, we will be offering more varieties of classes very soon. Jill’s method of teaching is closely aligned with one of her teachers, Jean-Pierre Marques from North Africa who was a pioneer in bringing Eastern traditions to the U.S. in 1971, and who later initiated the Spiritual Awareness Center at Canyon Ranch Spa in Tucson, Arizona. Relax and enjoy yoga in AmaTierra’s inspiring new open-air studio where the views will inspire profound transformation in your whole Self. The sleeping area has a comfy queen-sized bed, and an additional double bed can be arranged in the living room if needed. 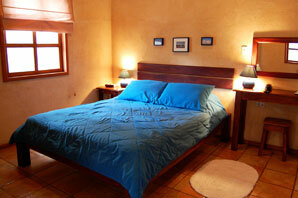 Ceiling fans, a refrigerator, coffee/tea maker, phone, complementary snacks and TV/DVD player. Choose a movie, free from over 250 in our collection, make your stay even more inviting. Settle in to a cool evening with a bottle of Chilean Cabernet and watch the sunset from your private terrace. In the morning, awaken to the sounds of nature. Take a walk to the stream or hike to where you can see the Nicoya Peninsula in the distance. 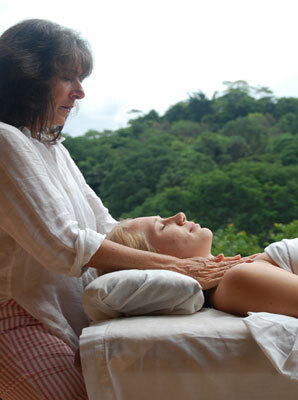 Meditation is an extra special experience here in Costa Rica. Rates good thru 2012. Green Season Specials good thru Nov. 30, 2012. Now let’s find what are the rates and packages they offer. All hotel taxes included (13%). Rates good through 2012. 5 nights lodging, double occupancy. Breakfast, lunch and dinner at Amatierra. Double occupancy: $995 per person. Single Occupancy: $1295 per person. All hotel taxes included 13%. Rates good through 2012.